Cryotheraphy is an incredible therapeutic treatment used to accelerate injury recovery, drain toxics and enhace blood circulation. During the session, you enter a cooled ‘pod’ at -180°C for up to three minutes – and the results are incredible. Not only does it kick-start the process of eliminating aches and pains, but is releases endorphins and as a result you feel refreshed and energised. The treatment can be used in isolation for some conditions or as part of a patients physiotherapy regime following surgery or trauma, to further enhance recovery and mobility. 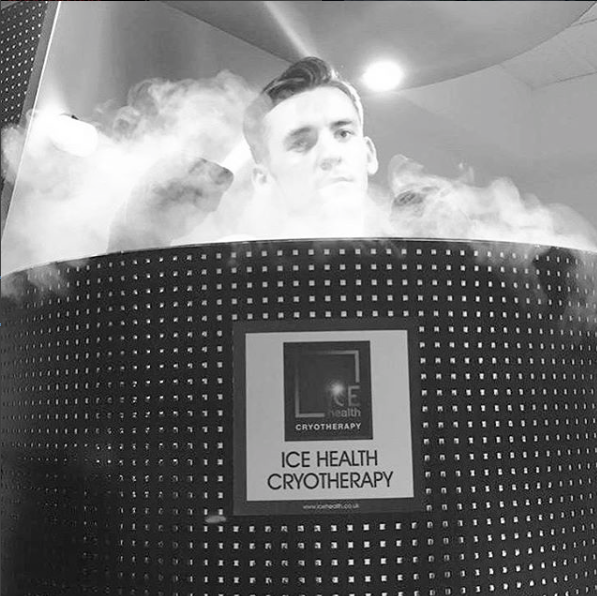 We were introduced to the ICE Health team in September ’17, when they generously agreed to support and rehabilitate two of our professional boxers through their 10 week training camps. Dan Keenan broke his hand over 3 years ago, an injury which never truly healed and had a negative impact on his professional boxing career. He started receiving regular Cryotherapy sessions, and gradually the swelling and lump began to disappear. After about a month of treatments, he was back to punching with 100% power and the pain was no longer. Dean Richardson suffered various injuries in his neck, back and shoulder through camp – all of which were treated with Cryotherapy. The benefits of just a couple of sessions are incredible, and we couldn’t recommend Alla, Gary and the team highly enough. For anyone suffering with sports related injuries, or looking for an energy boost this is a great, non-evasive treatment.